Welcome to another installment in a series of posts about an Average Joe trying to just get along…and finding new and funnier ways to fail at it. I couldn’t believe a girl this HOT liked me. Cheryl was smart AND beautiful AND (the best part!) dating me. Realizing that sooner or later she’d wake up and actually look at the guy she’d decided to hang out with, I knew I had to impress her fast. Time for some decisive action…something that would really WOW her. …something she’d remember in the middle of the night when she wondered “What am I doing with this dork?” I needed something to counteract that inevitable occurrence…something spectacular and romantic. I had it: we’d take a long weekend getaway to Chicago. Checking a few quick travel guides I stumbled on a bonus: there was a boutique hotel called the Claridge just north of the corner of Rush and Division (home of many bars and nightclubs!). Reviewer after reviewer said this place was a hidden gem, nestled among brownstones in a nice neighborhood. We were college students. I was paying my own way through school, working three jobs: building radiation walls (crappy work), as a telemarketer (even more crappy work), and as a DJ at frat parties and weddings (awesome work, but with horrible hours). Somehow I scrounged up $250 for two nights at the Claridge (now a boutique Hotel Indigo…here is the website), enough for gas to get from Detroit there and back, and a little more for food and spending money. My hotel choice was freakin’ awesome. The neighborhood was gorgeous, and sure enough, among the quiet brownstones, a little narrow hotel rose into the sky. Although the place was old, it had been recently renovated and had an old city charm. You would never know, with all the greenery and the families strolling outside, that some of the busiest bars in the city were only three blocks away. We parked the car ($20 a day in 1992. Are you kiddin’ me?). Valets carried our bags and I made my way to the reception desk. Seconds later I had my key and we were on the elevator upstairs. We opened the door to our room. There wasn’t a view of the city, but who cared. 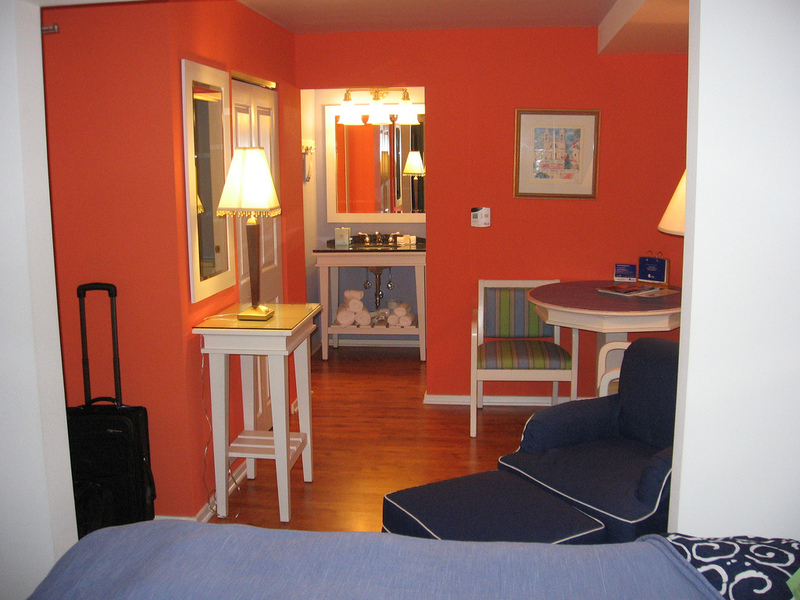 We had a carefully appointed room with classic prints on the walls, a big beautiful bed and nice little bathroom. I’m from the country. This farm boy had never seen anything so upscale. Get this: there were even terrycloth robes in the closet! Terrycloth robes! I put one on. Cheryl snapped a picture of me in it. She went into the bathroom to freshen up, and I flipped on the television. There was a fridge in the room. This wasn’t like a spring break fridge next to the scary kitchenette. Nope. This was a high end hotel. This was a FULLY STOCKED refrigerator. Nuts, beers, chips, those little Jack Daniels and Schnapps bottles, and more. I grabbed a beer, some macadamia nuts, and settled into a football game. I’d worked my way into the peanut M&M’s when Cheryl appeared in the bathroom doorway. “I think you have to pay for those,” she said. I smiled at the silly, silly girl. She smiled, said, “Really? Cool!” and grabbed a little single serving wine bottle and the Toblerone. After our on-the-house snack we hit the town hard. A little shopping on Michigan Avenue, Pizza at Gino’s East. Dancing at Mothers on Division. Imagine our delight to find chocolates on our pillows and the bed was turned down. This place was awesome. Someone had completely restocked everything we’d eaten from the fridge. The next day we were up early. After a morning at the Art Institute we had Chicago-style hot dogs off a cart in Grant Park. 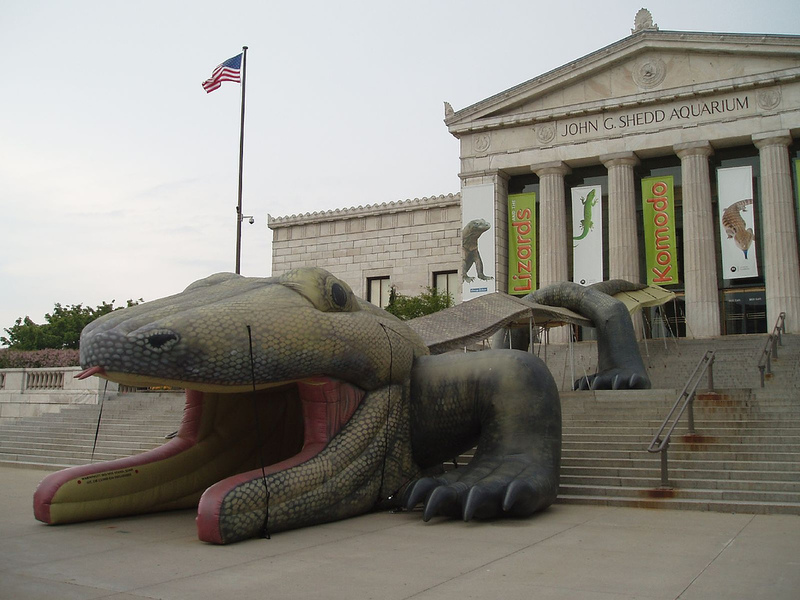 Then we toured the shark and penguin tanks, among others, at Shedd Aquarium. On the way back to the hotel we stopped at a steak place on Rush Street and then listened to some sultry sounds at a jazz bar. We were both tired from the day out and headed back to the hotel. Fridge? You guessed it. Restocked again. I immediately grabbed us a nightcap from our now-personal supply. We’d be leaving in the morning and I wanted to get my $125 per night worth. M&Ms, chips and wine up late talking with the hottest girl I’d ever dated. The next morning we packed early. Cheryl and I both had busy days coming up, so it was an early start, but I was sad to go. We left the room and were halfway to the elevator when I realized: the fridge. “Where are you going?” she said as I turned and marched back to the room. “Just meet me in the lobby.” I opened the door, crossed the room and laid my suitcase in front of it. Why hadn’t I thought of this before? This room was expensive as all get-out. I couldn’t leave these riches to waste. I’d already remembered to swipe the shampoo and conditioner. I’d stayed at a Days Inn before. This was just a Days Inn on a much grander scale, and I needed to take full advantage. In fairness to me, our minibar didn't have the pressure pads OR warning this one is equipped with. I opened the fridge door, took my hand and in one motion swiped everything from each shelf into my suitcase. Then I grabbed the drinks from the side holders and carefully placed those among the other treats. At the very least, this would help subsidize the trip and give us some snack food on the drive home. There was so much, we might not even have to stop for lunch. Bonus! This was before quick checkout procedures were popular, so I stood in the world’s longest line just to hand over my keys and grab the receipt. By the time I reached the desk, there was still a monster line behind me. Like I had with the people before me, I’m sure they were hoping I’d get out of the way quickly. What difference is it to you? I thought. But, she was being pleasant, probably passing time while she looked up my record. Those macadamia nuts? $5.25. Each beer? $6.00. The Toblerone? I was in shock and don’t remember exactly, but I think it was around $1,245,435.09. I glanced at my suitcase full of treats and then back behind me. The line now stretched across the entire little reception area. I glanced up at her, looked down at my bag again and across at Cheryl waiting patiently across the lobby. I’m the world’s biggest dumbass. I looked at her, trying to keep the pained look off my face. The keys to the room were still sitting in front of me. All I had to do was grab them and run for the elevator. I’d put it all back. I made my decision. I looked back at the woman. I tried not to glance at my suitcase. I’d brought the AmEx card only because I needed something for incidentals. I had no intention of using it. Any good hotel stories to share? Let’s keep the idiocy rolling in the comment section! In room coffee for $8! That’s insane. Ouch. I cringe to even think about it! I’m glad you guys had an awesome time in Chicago though. Chicago can be a REALLY fun place to visit/live. There’s always so much going on. It’s the story that cracks us up the most. It’s hilarious to us to think that I had no clue….live and learn. Dude! Great story and told very well. I was laughing so hard at the end that it brought tears to my eyes. “I had all of it.” You gotta be kidding me! I was LMAO as I pictured that scene the way you described it. “Excuse me sir?” Hahaha Thanks for the laugh. She was SUCH the pro. I was glad the guy behind us didn’t start laughing. Hilarious! I’ve been gouged by hotels before, but thankfully it’s always been on the company’s dime. The most expensive in room item I’ve seen was $7.00 for a bottle of water. I just drank out of the tap! $7 bottle of water…that’s crazy! I would have stuck with the tap, too. lmao too funny Joe! I can totally picture the scene. I’m sure you learned your lesson about those mini bars. I can’t say I’ve had a problem with those because when I was younger my mom wouldn’t let me eat the candy telling me how expensive it was. I think my only dumb move with a hotel was booking some anniversary ‘romance’ package. The extras I paid for were so pitiful. I forget exactly what all I got, but it included microwave popcorn, a small bag of chips and a pass to the public pool. They even gave us the romantic room right in front of the elevator. Every time I see a minibar now we just start laughing. It’s like touching a stove…once is enough. Did the room come with big windows so everyone on the elevator could watch your romance? Maybe it was “romance” for everyone BUT you! Yikes…talk about learning a lesson the hard way. That bill easily had to amount over $1,000. Thankfully when we started staying at the nicer hotels, it was recent enough that they now have the signs on them about being charged. I’ve never taken anything from the fridges but I do always open them up to see what’s inside. It wasn’t that high, but it was ugly. I’ve blocked it out now, except the story. At least you didn’t put the robe in your bag as well! The first time I ever stayed at a hotel with valet parking was a real experience. I had just graduated from optometry school and my sister had just finished her undergraduate degree before entering dental school. We booked a trip to Hawaii with a three day stop over in LA. We’re from KY and never traveled, so this was a stretch. Somehow we got booked at the Hollywood Roosevelt Hotel across from the Chinese Theater where the stars put their handprints. We had no clue about valet parking (our rental Kia POS by the way) or bell service. After that first round of tipping, we ran all over that hotel and parking lot trying to avoid the valets and bellmen. We parked across the street and moved every two hours to avoid the valet charges. When we checked out, we called the front desk who said they’d be sending someone up for our bags. We ran out with our bags and took the stairs to the emergency exit before they got there. I’m sure we looked like the two biggest rednecks on the planet. We’d have been more comfortable at the Days Inn. Great story, thanks for sharing. That’s funny, Kim! I totally thought about putting the robe in there, too! I think I got distracted by the minibar, though. I can imagine the two of you running down the fire escape. You should write that one up! That is so funny!!! I wonder how many people have done that not knowing they would have to pay for it all? And you are right, the lady behind the desk was quite professional. But perhaps they see many people do that. I think there has only been one hotel that I have stayed at where the stuff in the fridge was included in the price, or maybe I just told myself that it was included because my boss was paying. I’m pretty sure she knew I was an idiot, Sicorra. I’ve never been in another hotel where anything was included (except the coffee). Hopefully your boss didn’t mind the extra charges if they were extra! Wow, so cringe-worthy. I think I would have attempted to give everything in the suitcase back right there at the desk, apologizing profusely. Or said I “left something” in the room and run back up to put everything back. So embarrassing to have that happen in front of your new significant other. Oh, dear! What a story. Now I have beer all over my brand new laptop – but I am not going to hold it agaist you because I have not laughed so hadr for too long. It is one of these stories (and very well written) which are horrid when they happen and can entertain for the rest of time. Sorry about the beer, Maria! Cheryl must not be as smart as I’d originally thought, because she’s been Mrs. Average Joe for 19 years. I thought so! And Cheryl seems rather smart to me: you know what they say, it is important whether pweople learn. You obviously do :). Yeah, LBee, I’m smooth like that! Haha oh wow! That’s terrible, my heart was actually racing once I figured out where this story was going. Shame on them for not putting a warning sign! I would have made the same mistake if they didn’t always have the warning signs right inside the door. “I had all of it.” Classic! I’m glad someone else would have made that mistake, DC. I’m still pretty sure most people would have assumed that you had to pay. Me? Well, I’m the same guy who assumed something moronic in our story I Miss Checkbooks…..
On our honeymoon, the room had a mini-bar. Neither of us really drinks, but I like soda. One night, pretty late, I wanted a Coke- so I drank the one out of the fridge. The next morning, before checking out, we replaced it with a coke from the vending machine down the hall- for like 1/5 the price they would have charged us. When my mom and I took a short cruise, one of the things I specifically checked on was to make sure the coke in the fridge in the room was included. We did that the VERY NEXT time we had a hotel with a minibar. We went down to the corner store and replaced everything we ate and drank. Now they have those pressure sensors so you can’t even do that. 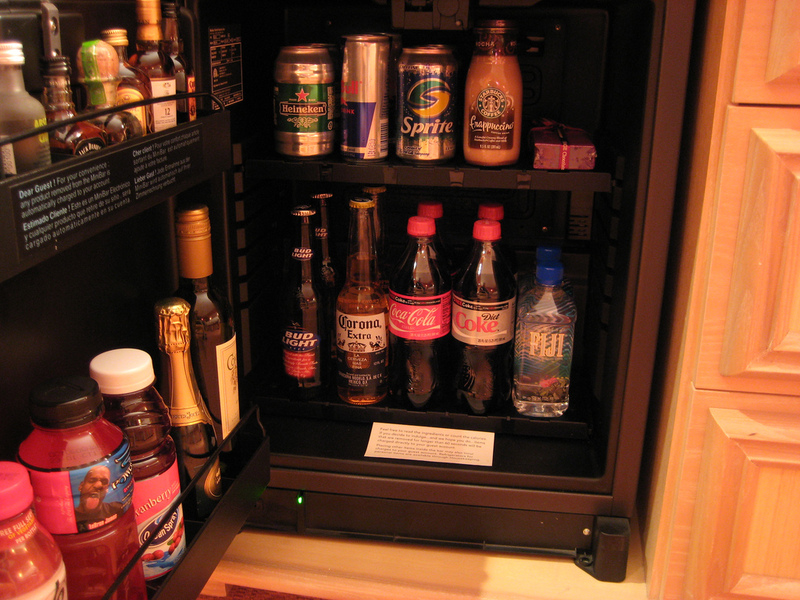 Of course, minibars are now going the way of the dinosaur because people don’t use them. It those prices, I wonder why not? I would toss it off as experience. I am glad you had a good weekend because you paid for it! The rule of thumb is there is no such thing as a free lunch. That’s hilarious! I would have said “Oh no, I think I forgot something!” And then RAN! I can’t believe how expensive those things are. It’s such an evil thing for hotels to do, too. I have fairly good self control, but some people are mad snackers! I know some people who probably can’t resist the overpriced snackage. But those mini-bottles of vodka and whisky can come in handy in a pinch. Yeesh, that has to hurt. We are usually pretty careful but we almost got screwed in the Dominican with bottles of water. Our room charged $7 per bottle. You can’t drink the tap water there so this is why they try to screw you. We decide to buy them up the street for $2. All I have to say is ouch. If I had never run across one before I would think the same thing although they all seem to be labeled these days. There wasn’t one in my Disney hotel room but I did check to make sure there were no charges before I left yesterday! Dude that is a crazy story. I’m glad I’ve never touched those minibars when I’ve stayed in hotel rooms. I think the most expensive thing we bought when we were in a hotel was paying for a movie. If I remember right it was like $16, but that was for a movie that was still in the theatre so it wasn’t that expensive. Cleverly written. I bet you’ve told this story more than once at a dinner party. The mini bar will get you every time! I don’t even open that mini fridge most of the time because I know everything is so overpriced. I think the first time I remember staying in a hotel room my mom warned me “DON’T touch the snacks!! Nothing!” and I’ve treated minibars like kryptonite ever since. heeeeeeeeeeeeee! I love this story. You’re forgiven for not including me in the last roundup. So, when the husband and I were dating we decided to go to Baltimore for the inaugural summer of interleague baseball. The Mets were playing the Orioles and of course, being the wise, frugal college students we were, we paid about $100 for the tickets, almost $300 for the room and I’m sure there were other expenses I’m forgetting since it was 14 years ago and I have the memory of a goldfish. Two memorable moments from that weekend: one, I saw Todd Hundley in the lobby and refused to talk to him OR show the husband where he was even standing. Two, I was in the bathroom and I kept hearing how loud the damn TV was. I kept yelling for him to turn it down and he kept yelling back that he did. Well, turns out, there was a speaker for the TV in the bathroom. I learned my lesson the day a waitress asked if I wanted dipping sauce for my breadsticks and charged me $6. Ever since that day, I’ve come to distrust any offer of seemingly free food or booze. Luckily, it only cost $6 and I was embarrassed at that. Your story certainly one ups me a bit. Being fortunate enough to stay in Vegas once a year for work, I can say that I stayed at some fancy hotels and awesome rooms. Bar fridges are never free – unless they’re at an all inclusive and topped up everyday. However, bar soaps and shampoo’s are all mine – each and every time. I have exact opposite story tot ell. once we were staying in a hotel on a business trip for almost 20 days. Wife was with me. The hotel (Hyatt) arranged for a meet n greet event for all long standing guests. Where my wife complained about not having her choice of food in the breakfast (free).For next few days that we stayed there our breakfast were served at our room and they only contained what she liked. GREATNESS! You should write a script based on that story! It would make an excellent sit-com episode!!! I remember going to Vegas a couple of years ago and freaking out when I saw my kids reaching for a bag of cookies! It was one of those slow-motion experiences. I think I hurdled the couch, our luggage and a coffee table trying to get to them in time. And considering how large of a guy I am- it was a truly impressive sight…at least according to my wife and kids it was. Oh, my gosh! Too funny! I’m so sorry it happened, but talk about situational comedy. I hope the bill wasn’t really in the million range, though. that would be so horrible. There’s a (super swanky) place in DC that always tries to charge me for parking and the mini-bar even when I don’t use either. Even when I upfront tell them they did that to me last time and I don’t want them to do it this time. I’ve found that the fancy hotels are often more likely to nickel-and-dime than the mid-range places. And the fancy places *always* charge for internet. Based on traffic and the wealth around Austin, I think it’ll do well. People who understand unique ability are willing to pay for time. Charge for the minibar when you don’t use it? How about if you eat and drink everything? Same fee? That was funny and bought a laugh to an otherwise drab day. 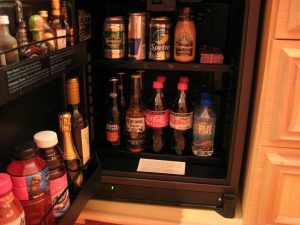 I’ve heard a few “first experience with mini bar” stories but this one was the best yet! Thanks! I had to read this again — thanks for sharing it once more. It’s my favorite. Of all time. Anywhere on the internet.